smartARM created an affordable robotic hand prosthetic and were awarded $85,000 cash. An amount of $15,000 will be given to the Drugsafe team from India for their project using Big Data. Microsoft has announced that the smartARM team from Canada are the winners of the 16th edition of Microsoft Imagine Cup held at the company's headquarters in Redmond, US. The team created an affordable robotic hand prosthetic, using Microsoft Azure Computer Vision, Machine Learning and Cloud Storage. The arm uses a camera embedded in its palm to recognise objects and calculate the most appropriate grip for an object. The smartARM team will get a mentoring session with Microsoft CEO Satya Nadella, $85,000 in cash and a $50,000 Azure grant. Team iCry2Talk from Greece came second with a low-cost and non-invasive intelligent interface between infant and parent that translates in real time the baby’s cry. The interface associates the cry with a specific physiological and psychological state and depicts the message in a text, image and voice message. The third spot went to Team Mediated Ear of Japan for its project, Mediated Ear. It is a software for hearing-impaired individuals to focus on a specific speaker among a multitude of conversations. Mediated Ear can relay specific sounds in audio waveforms through deep learning. At this year’s Imagine Cup, Microsoft added special awards of $15,000 for projects that incorporate three key areas of digital transformation: Artificial Intelligence (AI), Big Data and Mixed Reality. SochWare from Nepal, won the AI award for designing a solution to help farmers identify plant diseases, suggest mitigation strategies, connect with experts, and get updated with recent agriculture findings. Pengram from the US won the Mixed Reality award for making a solution that holographically “teleported” the engineers from different places into a workspace when needed. Commercial Software Engineering, Microsoft. DrugSafe was the first runner-up in the India chapter of the tournament. 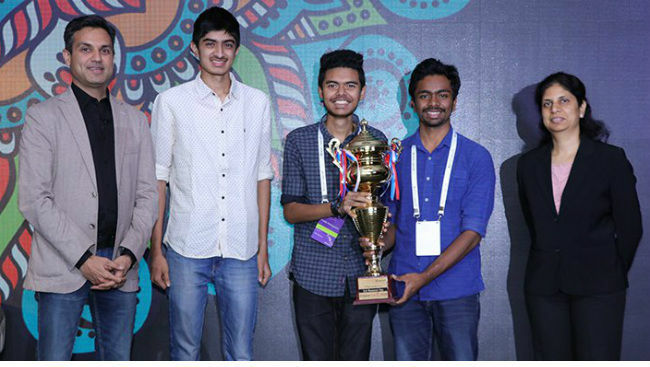 Drugsafe (Chidroop I, Pratik Mohapatra, and Srihari HS from R. V. College of Engineering, Bengaluru) from India won the Big Data award for their solution to validate genuine drugs and decrease illness from counterfeit substances. The team was one of the three participants that represented the country. Drugsafe is an app that uses Optical Character Recognition (OCR) to identify minute details in the design and packaging of medicines and compare them to the original manufacturer’s patented and trademarked attributes. After three levels of checks, discrepancies are flagged to help users identify medicines as counterfeit. Microsoft Imagine Cup is a tournament in which students from across the globe, make useful projects using cloud-based technologies like, AI, Big Data, Mixed Reality, among others. Since its inception, nearly 2 million students from over 190 countries have taken part in the tournament. Cover Image Caption: Satya Nadella with smartARM team that have been crowned the 2018 Imagine Cup World Champions, along with Chloe Kim, special guest and Olympic snowboarding gold medalist.